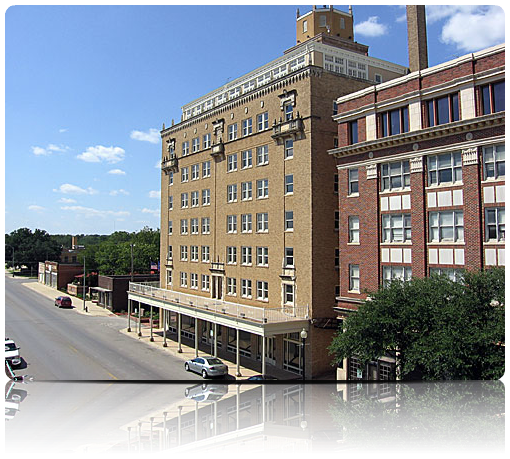 The Eastland Chamber of Commerce, which was chartered with the State of Texas on May 23, 1921, has been a long-standing influence in the community. It was established as a member organization, governed by a board of directors who were elected by a voting membership. The earliest known by-laws on file for the organization are dated October 16, 1919. Subsequent editions of these by-laws also exist in the files at the Chamber office and are an important part of early Eastland history. Written minutes from as far back as 1926, reveal a unique account of early day business in Eastland and show that development of the business community was the focus from early on in the history of the Chamber of Commerce. Familiar old Eastland names appear time and again in these minutes, re-enforcing the strength and influence our early day businesses and citizens had on our community. Presently, the Eastland Chamber of Commerce consists of approximately 200 dues paying members, a board of ten directors voted on by the membership, an administrative assistant, and a manager. Membership dues are assessed according to the number of employees the incoming member business currently has and the financial impact the community has on that businesses revenue. Join us today! Activities of the Chamber of Commerce include, welcoming new members and businesses with Redcoat receptions, assisting new businesses in town, providing educational seminars, and promotion of the business community through events, advertising and tourism. See complete list of benefits provided to members. Volunteers are the key to the success of the Eastland Chamber of Commerce. Without the many volunteers who serve on a number of committees, the Chamber of Commerce would be unable to represent the community and the businesses within it. The volunteers are what makes our organization successful.